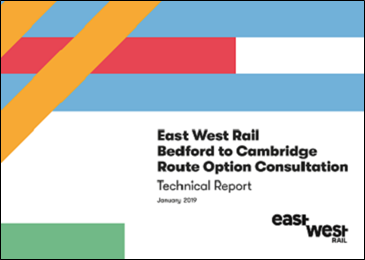 While the Western Section between Oxford and Bedford can be built by reinstating and upgrading old rail lines, for the Central Section between Bedford and Cambridge we need to build an entirely new rail line. 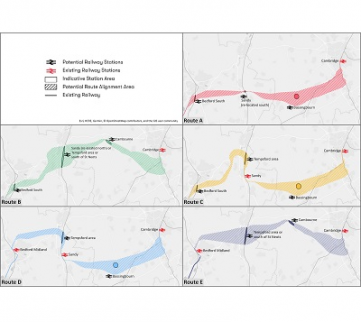 The final alignment of this rail line and new stations will be located within the broad area shown on the above map. 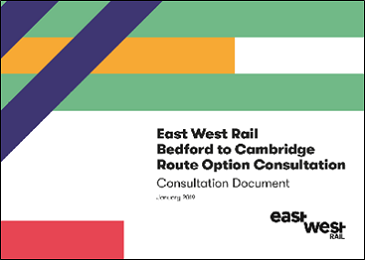 Between January and March 2019 we held a six-week consultation to ask for people’s views on our five most promising route options: A, B, C, D and E. More than 3,500 people came to our eight consultation events held across the route corridor. We also made our consultation information available on our website and at council buildings in the area. Our Consultation Document, Technical Document and maps can be downloaded below. The consultation closed on 11 March. We’re now analysing feedback and we will publish our consultation feedback report and preferred route option later this year. We’ll announce this publicly in the media, on this website, and via our newsletter which you can subscribe to here.